This section deals with known, unknown, secrets, beliefs, rituals, practices, history and philosophy of esoteric, mystic Hinduism. One of the dominant features of Hinduism is the secrecy associated with many of its practices. Historically, the higher aspects of Hinduism and mystic Hinduism were reserved for a few qualified practitioners. The scripture state that the deeper secrets of the Hinduism should be revealed only to the most qualified people and even that should be done by adept gurus at their discretion and according to the spiritual progress of their disciples. Because Hinduism is an ancient religion with its roots both in the ritual and spiritual traditions of ancient India, it is difficult to know it fully without spending considerable time in its study. To practice Hinduism, you may not require much effort, but to know it and master it, you need specialized knowledge, which cannot be done unless you study its scriptures and their subtle nuances. Hinduism is complex religion. Its scriptures abound in symbolism while its rituals have manifest content and hidden content. Many secrets of Hinduism will never be made public because they are revealed under an oath of secrecy. 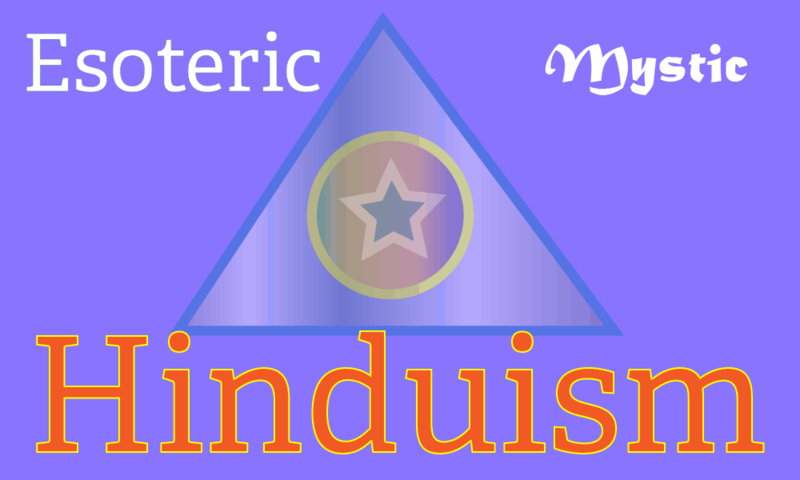 In this section on we intend to publish essays on the esoteric and mystic aspects of Hinduism, which are in common knowledge. They are the hidden secrets of Hinduism, which are generally not revealed to the public. Their knowledge will help the readers understand its range and depth as a religion of the body, the mind and the spirit. Know the significance and symbolism of important sacred animals of Hinduism, and the treatmentof animals by Hindus. Secrets of life after death, the reason for different near death experiences, and the fate of liberated souls and bound souls in afterlife. Be it a complicated form of Vedic ritual such a yajna or some simple form of worship performed ordinarily in millions of Hindu households everyday, the process of worship in Hinduism invariably involves the use of three basic techniques, namely the mantra, the tantra and the yantra. THE YAJURVEDA—derived from the roots yaj, to sacrifice or, worship, and vid, to know,—is the Knowledge of Sacrifice or Sacrificial Texts and Formulas as distinguished from the Rigveda or Knowledge of Recited Praise, the Samaveda or Knowledge of Chanted Hymns, and the Atharva or Brahmaveda which is the Knowledge of Prayer, Charm, and Spells. The eyes remain closed, as we join our hands or bow our heads in the presence of God. But in most instances, the mind remains active and distracted as usual. In such cases, prayer becomes just another activity, some kind of a ritual performed to keep our fears and feelings of insecurity assuaged. "Prarthana" is the word that is used in Sanskrit and most of the native Indian languages to denote the meaning of the word "prayer". In social parlance, the word is also used to mean to request, or to ask or seek something politely. A very unique presentation of the symbolic significance of Hinduism, largely unknown and deeply hidden in the labyrinths of time and history. "THERE was neither day nor night, nor sky nor earth, nor darkness nor light, nor any other thing save only ONE, inapprehensible by intellect, or THAT which is Brahma and Pumis (Spirit) and Pradhana (crude matter)" (Veda: "Vishnu Purana Commentary"); or literally: "One Pradhanika Brahma Spirit: THAT was." The "Pradhanika Brahma Spirit" is Mulaprakriti and Parabrahmam. We can ask for any thing we want in our prayers. There is nothing wrong in our asking for some material gain. It depends upon how much faith you have in God and to what extent you can relate yourself to Him or Her. Each definite thought produces a double effect—a radiating vibration and a floating form. The thought itself appears first to clairvoyant sight as a vibration in the mental body, and this may be either simple or complex. If the thought itself is absolutely simple, there is only the one rate of vibration, and only one type of mental matter will be strongly affected. In a general sense, a mantra is a divine prayer. It is revealed by the divine, for the common good of man, in a language we can understand. It is the expression of a mind, which is filled with divine vibrations, which is full of divine love and is in search of Truth that is beyond it. A Theosophical and Occult presentation of what happens to beings after their death, how they pass into the astral world, how they create their own purgatory and heaven through their own making, how the astral bodies are formed, what happens in the astral world, etc.. According to this author the ordinary conception of matter needs a revision, for what are commonly called force and matter are in reality only two varieties of Spirit at different stages in evolution and the real matter or basis of everything lies in the background unperceived. The Author discusses the history and antiquity of Zodiac among ancient civilizations, how the various Zodiac signs came into existence, and how the present day Zodiac system came into existence.. This article contains bits and pieces of information on occult practices and answers to a number of questions, asked by various students of the courses in Yogi Philosophy. Excerpts from the Book The Autobiography of a Yogi by Swami Yogananda, Chapter 22, in which the Spiritual Master speaks about an extraordinary experience he had during meditation in which he saw the Dakshineswar Temple and had a mystic vision of the Divine Mother. An Account of the Kinds of Sins which lead to Hell. Excerpt from the Garuda Purana which deals with death, rites associated with death, various kinds of sins and how they torment the souls in hell.